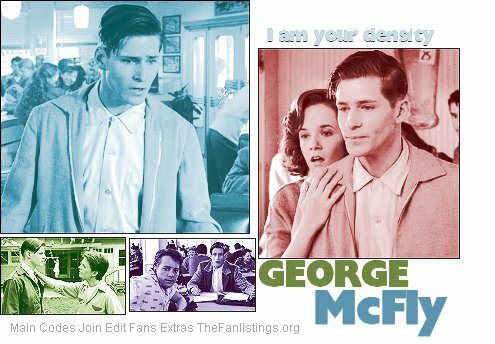 to I am your density, the Fanlisting for George McFly, played brilliantly and humorously, by Crispin Glover, in Back To The Future. To this day, this remains one of Mr. Glover's best loved characters, and is also one of my own personal favorites. Above is where you will find the links to get yourself added as a fan here. If you own a website, please link back to I am your density with an image code, or text link. Copyright © Thin-Man.com 2006. I am in no way, shape or form affiliated with anyone involved with Back to the Future, or Crispin Glover. This is just a site made by a fan, for the fans. The Fanlisting was adopted from Amanda in March, 2006. Crispin Hellion Glover's Official Website is crispinglover.com.